I read this book for a new book club, one that I didn’t end up going to! I’m still a member of the classic book club, but they’re on a summer break right now. This is the story of two University students, Frances and Bobbie who become entangled with an older, married couple, Melissa and Nick. Melissa is a journalist and spots Bobbie and Frances preforming open-mic poetry together and wants to write a piece on them. They spend time together, along with Melissa’s husband, to formulate the piece and become friends during the process. The novel is written from the point of view of Frances, a very introverted, intelligent young woman, who proclaims herself to be unemotional and flat. Her friend Bobbie is in many ways her opposite, fiery, impulsive and often overtly emotional. The two make a fantastic pairing. Frances is a communist and they both have very clear views about society and its structure, often informed by Bobbie’s degree, Anthropology. If you’re worried it’s overly preachy, don’t be, discussions that take this line happen seldomly. There are some rather heated exchanges, but these are fleeting and take a back seat to the dynamics of the relationships. It did sometimes feel like the author was trying to impart her views, but it wasn’t too much to be distracting. 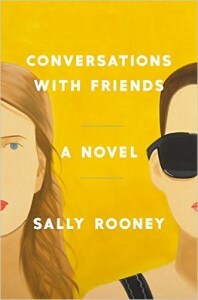 The novel was mostly about relationships related to the nature of the self and finding oneself. Bobbie was so often trying to pass herself off as one thing when she clearly wasn’t. She would say something contrived, instead of how she really felt and had a deep discomfort with herself that oozed from the pages, the main reason I loved it so much. I’ve never read a character that felt more real than Frances. It was like I knew her and what she wanted better than she did, even if she couldn't communicate it to anyone else. I can see why this novel wouldn’t be for everyone. Some could find it overindulgent, the pair preachy and immature. I, however, loved it and just wish it had gone on longer.